Feel free to post here any screens from game that can illustrate any features of mod. I'll post a few images of my own. They're not much, but they're better than naught. Me and two Tyrell knights. Case in point to the...shall I say, anachronism of their armour. 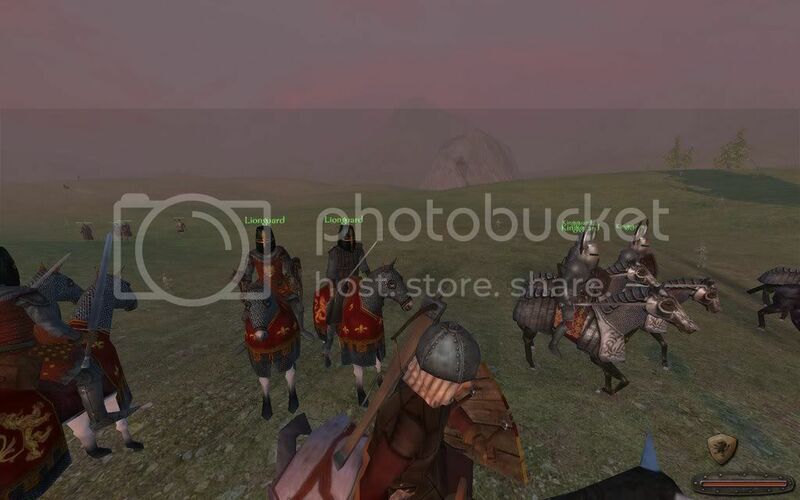 They look rather like eastern Cataphracts than western knights. 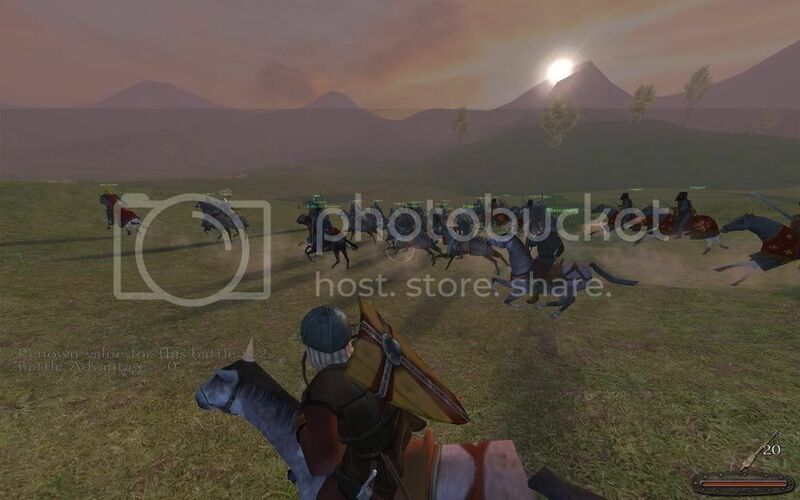 A battle between mountain bandits and Tyrell horsemen. I'll post some more later. I hope the RCM is going along nicely. 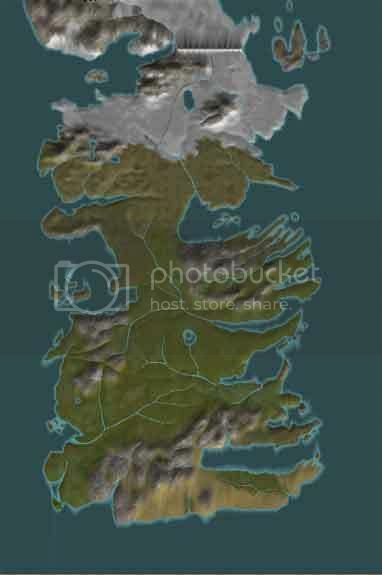 Further Ice and Fire goodness! A battle between the Tyrells and the Lannisters, with the Tyrells being led by the famed Knight of Flowers, Loras Tyrell, and the Lannisters led by the even more fearsome Kingslayer, Jaime Lannister. 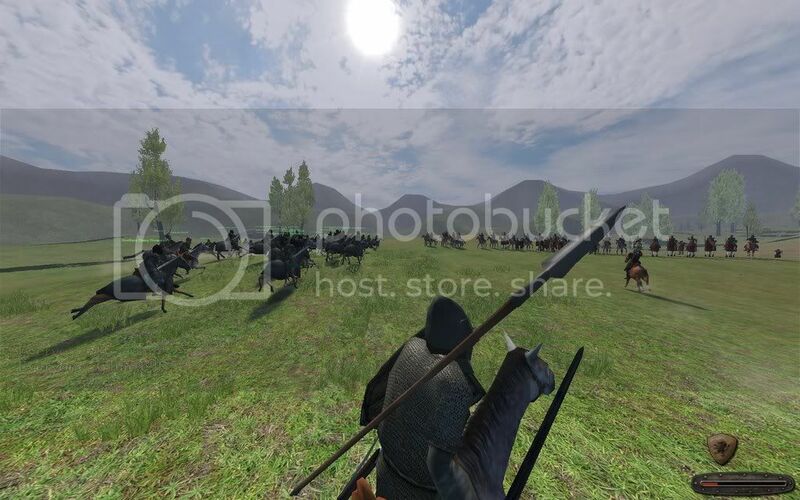 My character is in the cavalry charge at the beginning of the battle. In the first image, Jaime Lannister is the character farthest to the left, the helmless one. 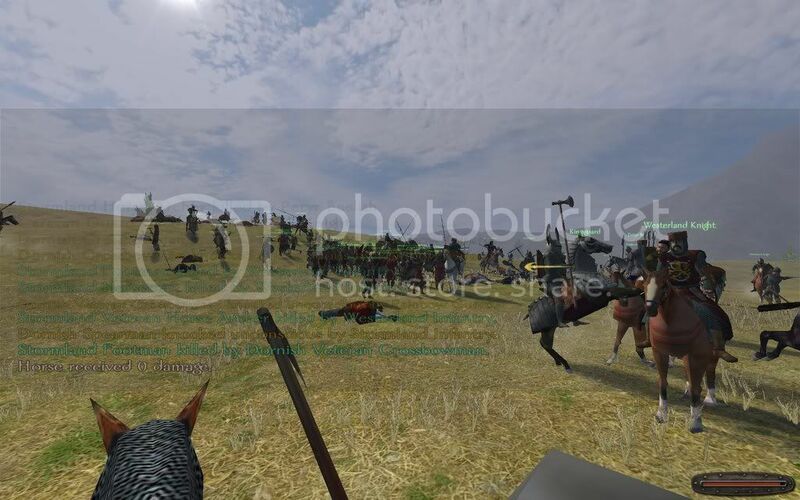 These are two more pics from the battle. 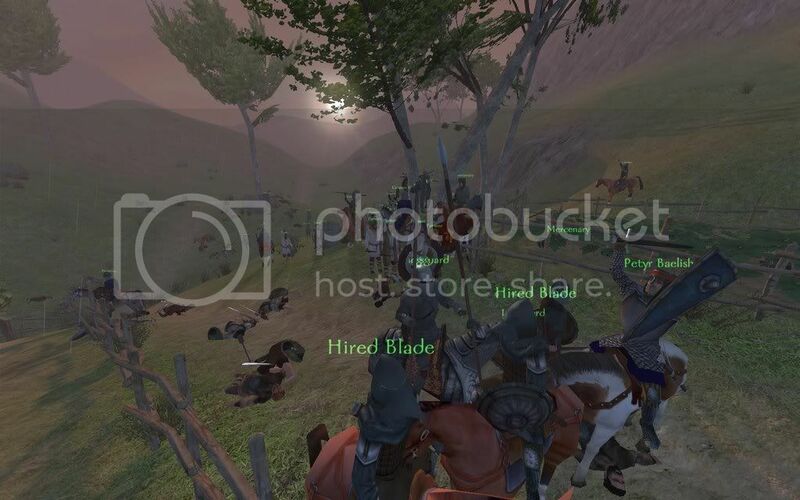 Visible in the screenshot are also several members of the Kingsguard. Surely, once RCM is applied, these awesome warriors will be the last to leave the battlefield alive, thanks to their armour and weapons, which are of the finest quality. Well, there are several ways. You can take them the simple way, by pressing "print screen" and then pasting the image in MS Paint and saving it or you can use Fraps to take pictures (or record videos). 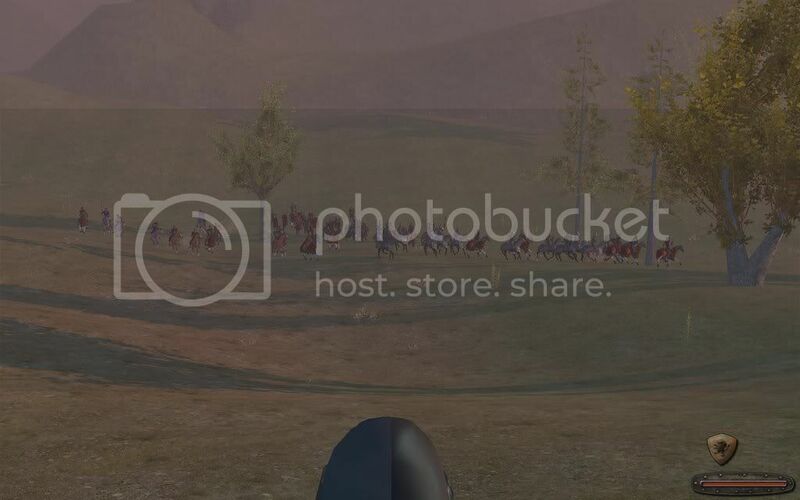 After the screenshot is actually taken, you have to host it on a site. Imageshack or Photobucket will do just fine. 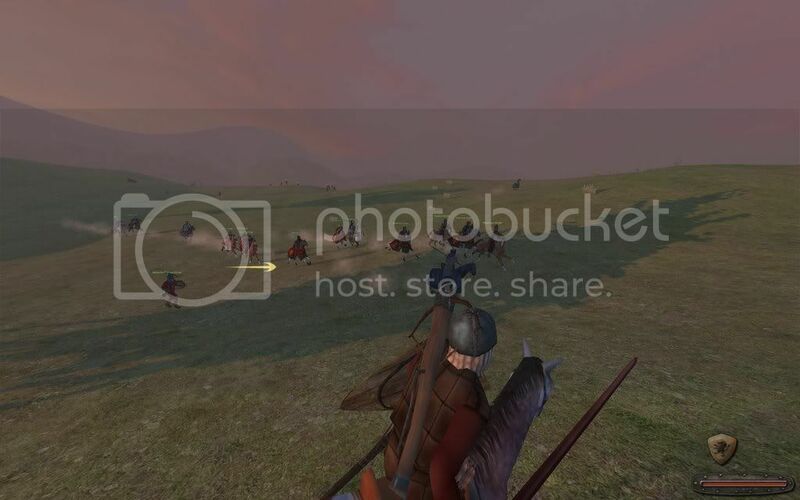 Imageshack doesn't require any form of registration while Photobucket does, but you can make albums and whatnot in Photobucket, keeping your pictures grouped together. That would be a simple guide of taking screenshots. Case in point, here are a couple of other screenshots. The equipment my character scavenged after the battle with Loras Tyrell's host. Pretty nice huh? 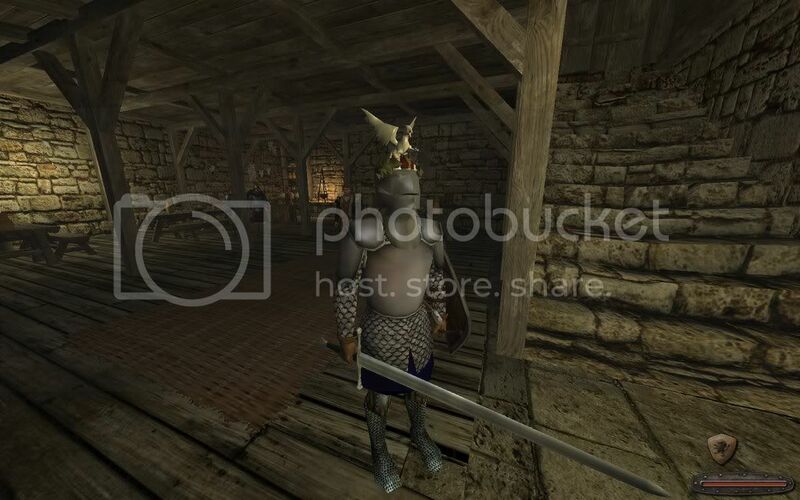 I bought the helm with my own money though, after the battle. In Lannisport, I think. 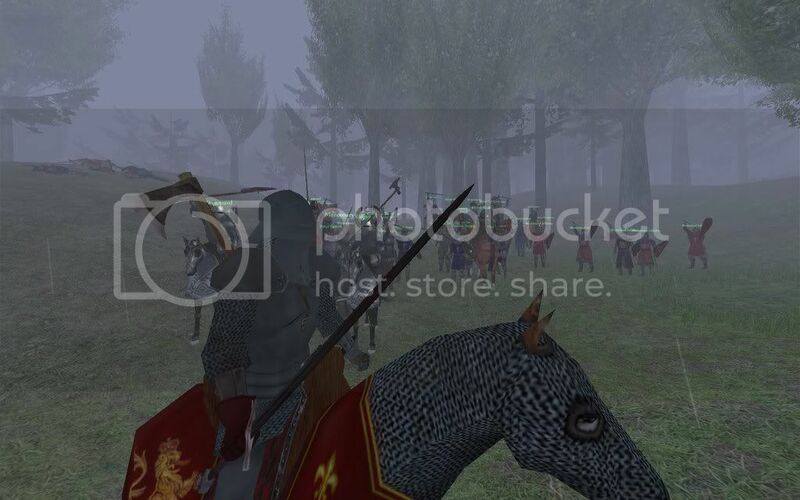 Another shot from the battle with the Tyrells. 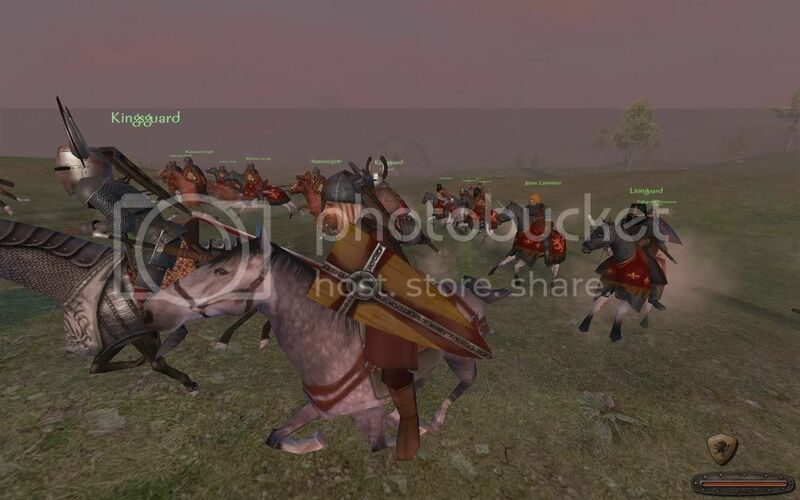 Here, you can see the Lannister cavalry forces (especially the top-tier ones, the Lionguard and Kingsguard) more clearly. I like their look the most, out of all the other faction cavalry. I think they are truest to the look and feel of the books. Yet another batch of screenshots for your enjoyment! A battle against the Lannisters. 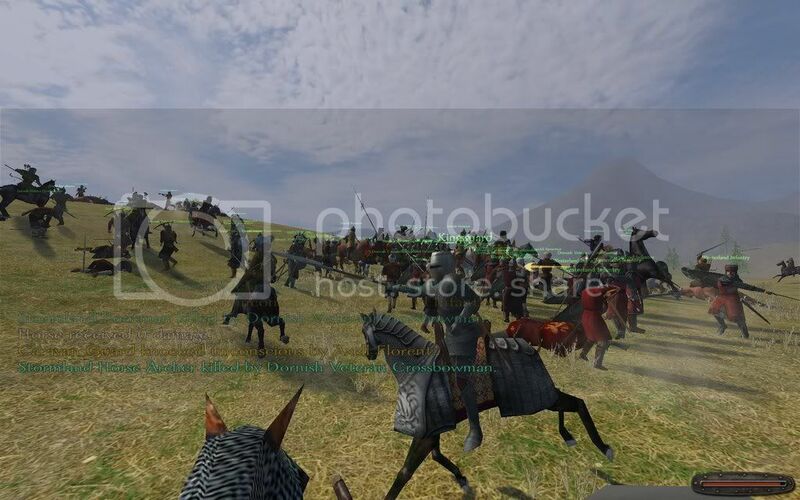 Visible in the image is the impressive cavalry of the Westerlands with the Kingsguard and Lionguard in the centre and right of the image. Another battle against the foul Lannisters, this time with the Starks on my side. 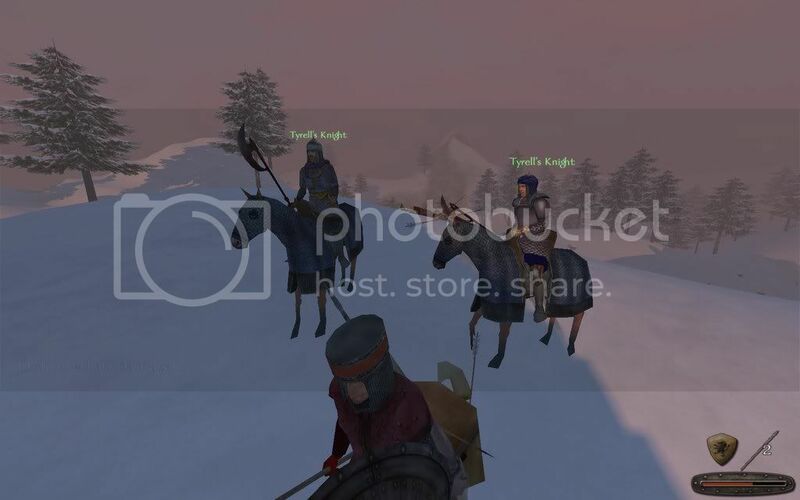 Here is my character leading the charge of the Northern heavy horsemen. While the cavalry joins battle as well. A right good slaughter all in all. I hoped you like this batch. I'll have some more posted in the near future. This is my Dornish character, Edric Sand. Alright, I know, it must be painstakingly hot in the desert with that armor (Yes, that's Rhaegar's Helmet and Gauntlets). 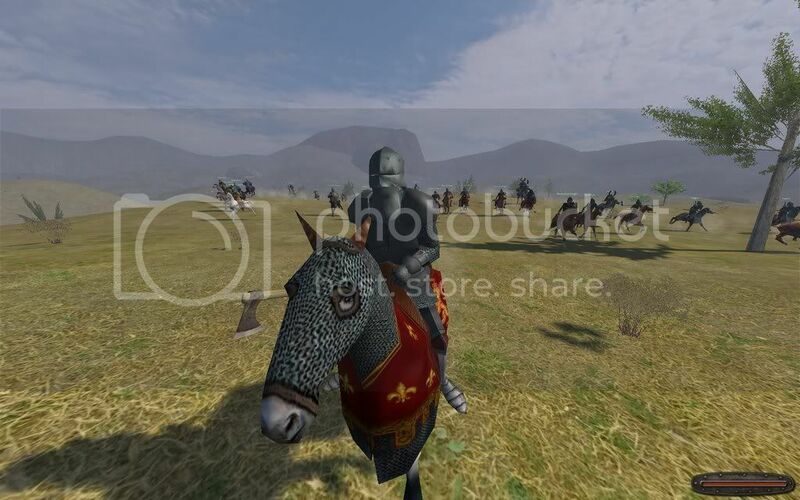 And wierd with a Charger too, but in some of the larger battles a horse is simply required to win. 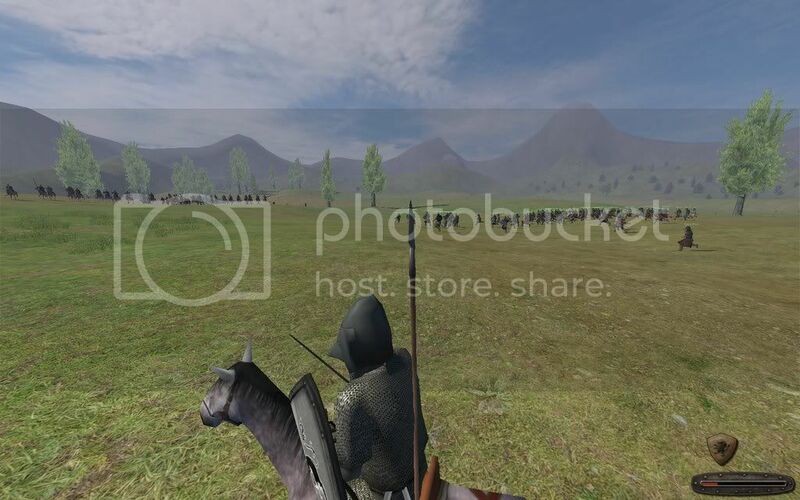 My party consists of 40 Dornish infantry, including some crossbowmen, and also around 5 good-equipped heroes with horses. 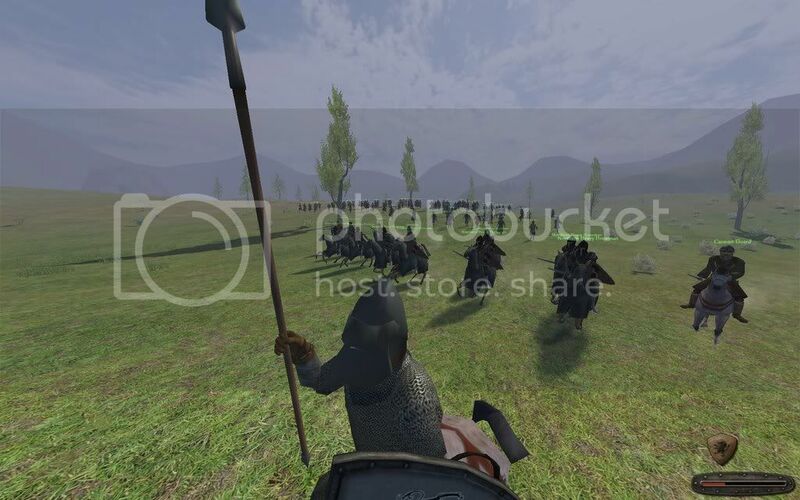 The heroes act as my personal bodyguard on the battlefield, I put my spearmen on a cliff or protected by water, then I myself ride around the battlefield as a killer-machine, my swift dornish spear (Great job on that spear btw! 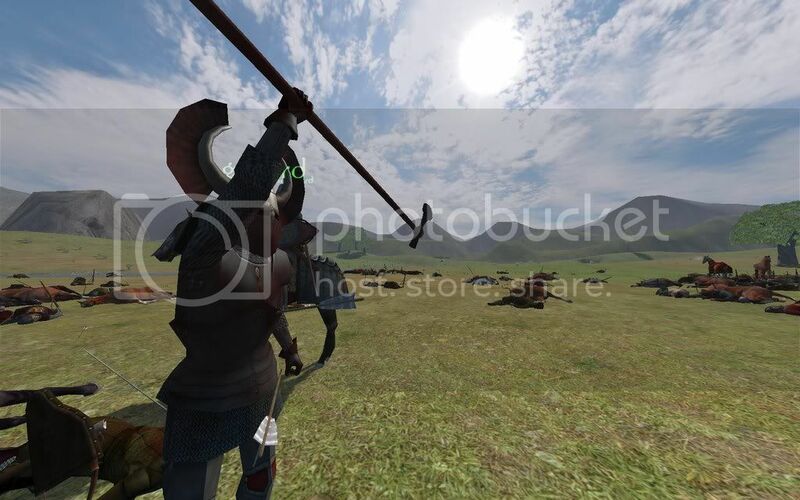 First time I use a spear for anything other than a lance ) impaling body after body. The upper picture is from a battle against Ser Loras Tyrell and his host of roughly one hundred men. 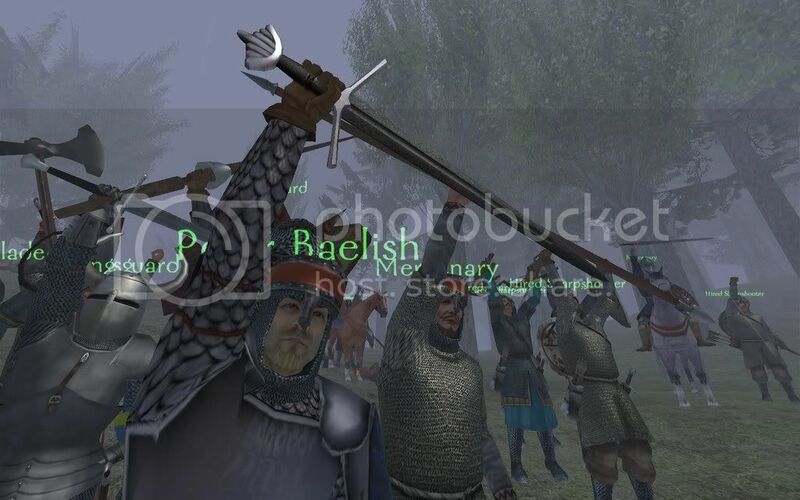 It was fierce and involved Edric unhorsing the young knight, short Dornish Spear versus Great Lance. Seeing their commander fly off his horse (Loras managed to escape though) caused a huge morale drop amongst the Tyrells. They routed. 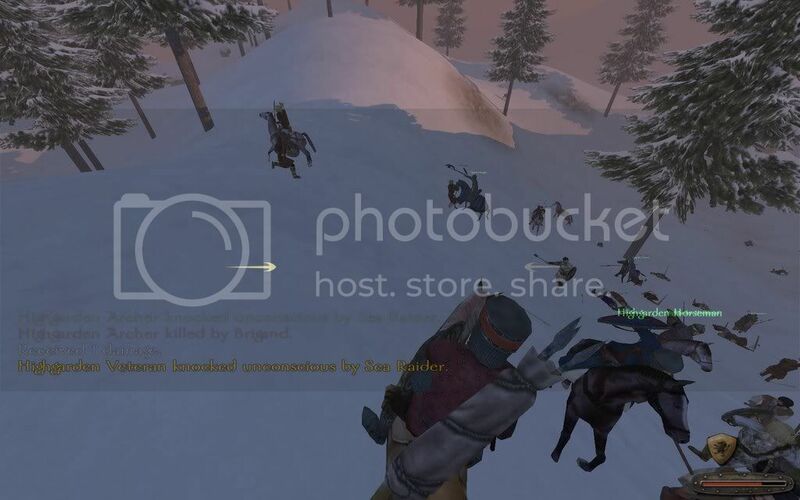 The screenshot was taken after the last 20 routed Tyrells had been slain, which explains the lack of blood. This particular picture was taken after a battle against Ser Garlan Tyrell, Loras's elder brother, and his wisdom appears to be somewhat lacking (also referred to as Bravery?). At the beginning of the battle, Garlan charged up a cliff straight into a dozen of my spears - he was captured within seconds (but somehow my party managed to do the same mistake yet again - they forgot to keep a good eye on him - so he managed to escape). The Tyrells fought on valiantly, though without success. They simply couldn't match my experienced (They have fought Tyrell, Baratheon and Lannister armies) Dornishmen (There's a few Lannisters temporarily in my party, whom I rescued from the Tyrells). Soon their spine were broken and they started to flee, and when we caught up on them they fought to their deaths, without managing to slay a single soldier of mine. 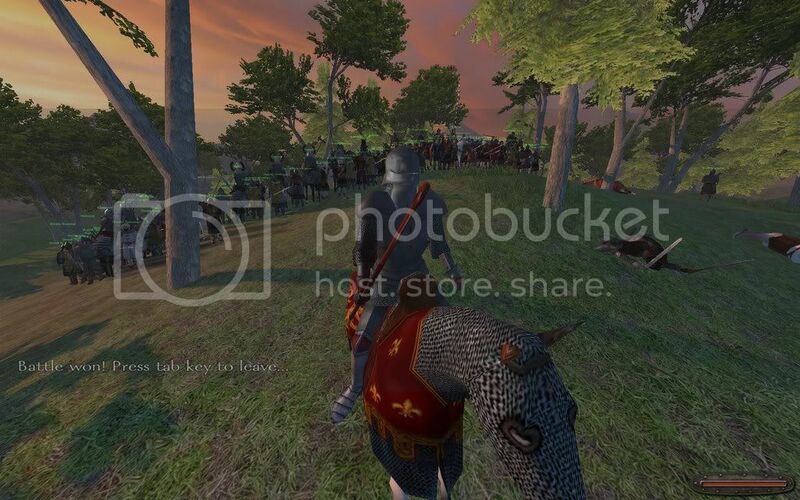 Another battle versus Ser Loras, it was rather difficult to unhorse one of the very best tourney-knights in Westeros, while attempting to press Print Screen, therefore, I took it ever so slightly early.. But it's clearly visible that he is just about to fall. Yet another battle versus Loras Tyrell. I also have, as you can see, a new Armor. Just a Great shame the texture is stretched out on the upper part of the sword: , but hell, it's barely noticable unless you know it's there. I Love it! Great job on on that Valyrian Steel blade! Good to have another contributor on the screenshot front. This is ultimately publicity for our favourite mod, so churn out those screens people. Anyway. My latest character, Ser Samwell, in a tavern in Riverrun discussing with the leader of some mercenary archers about the fees they could accept in return for service. Did anyone ever notice that Howland Reed's banner looks exactly like the Lacoste logo? Shooting people off their horses when in it. That and hacking them apart with his two-handed sword. I hope you liked these screenshots. 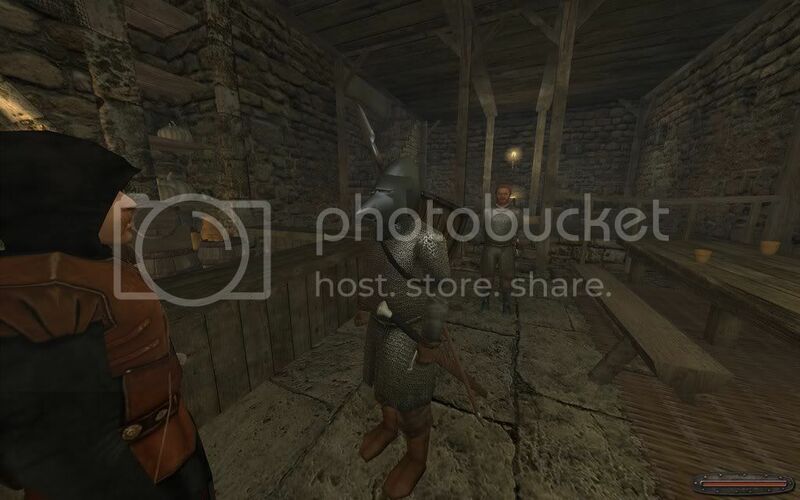 You can see the pig-faced bascinet in these shots pretty well, I'd say. I can't wait to see its stats post-RCM. A new batch of screens, all post-RCM! Enjoy! 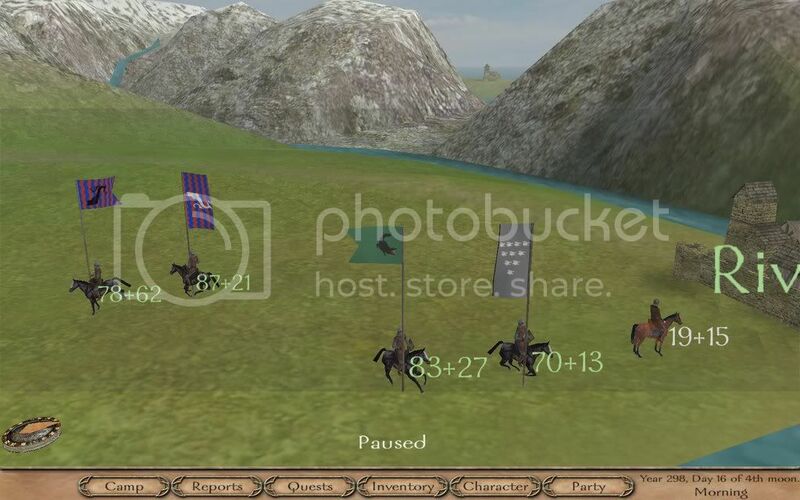 My current character, Ser Allister (Ser Samwell's been sidetracked), leading the charge of the Lannister and Dornish cavalry against the Baratheons. 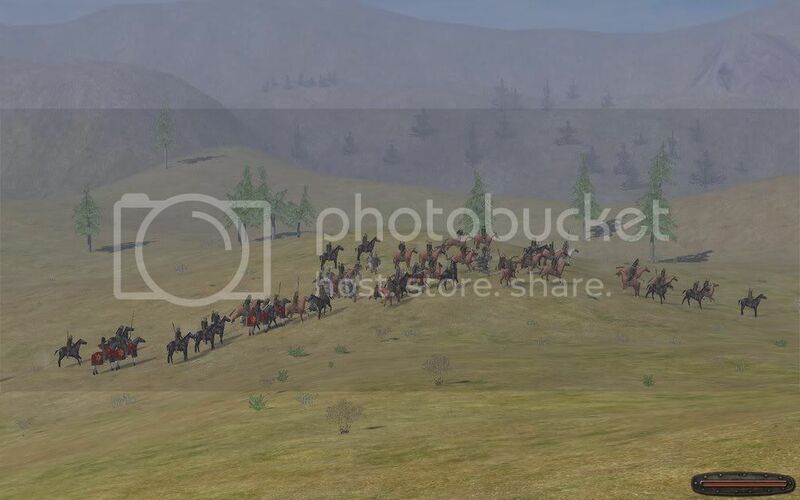 The Baratheons forming a line with their own cavalry so as to counter-charge. 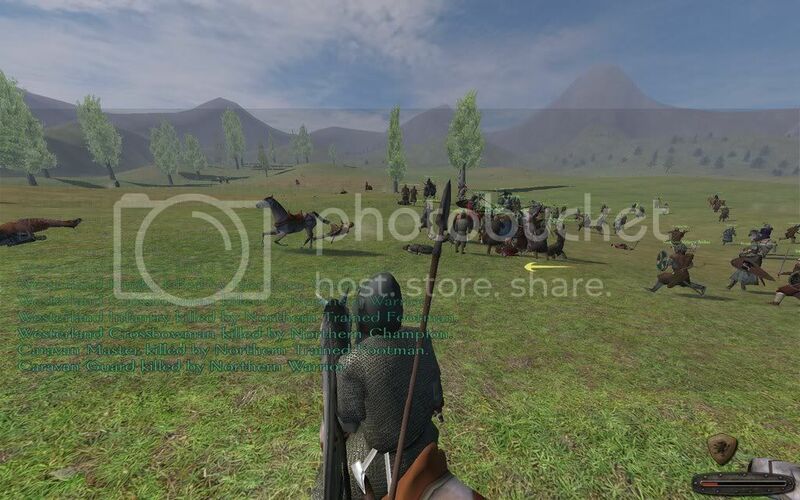 Visible in the screenshot are Stormland Horse-Archers and the Baratheon knights. Battle is joined and the Baratheons start loosing ground. Truth be told, they are rather weak and easy to defeat. I wonder why? 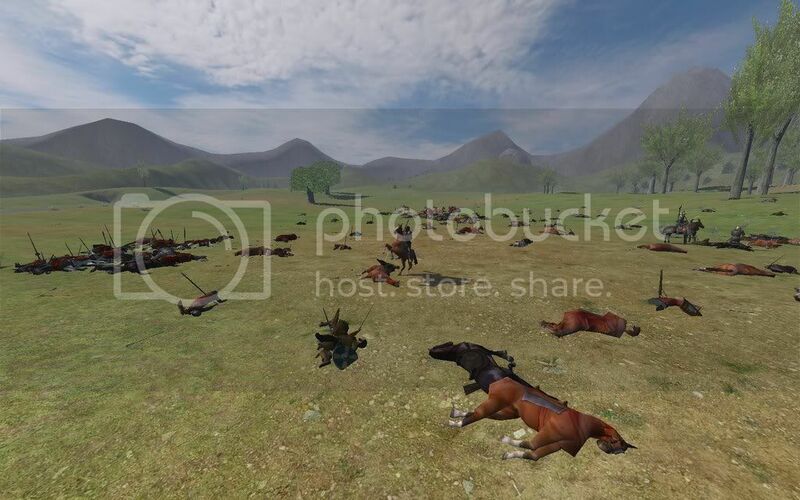 The bloody aftermath of the battle with the Baratheons. 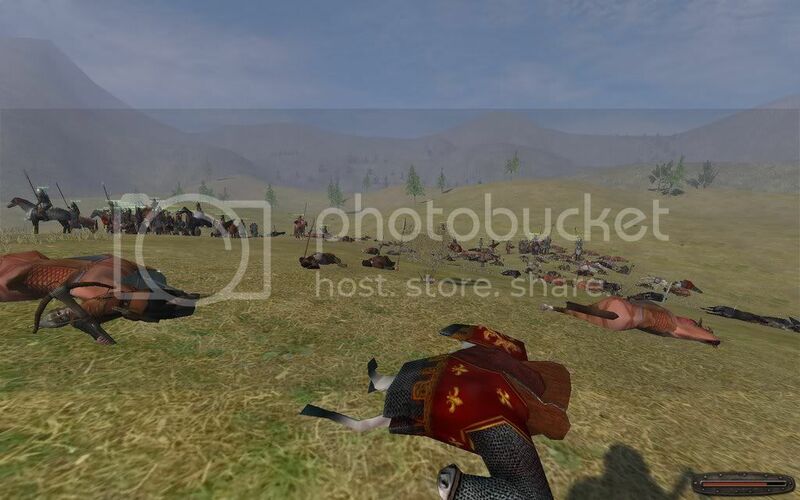 Dead from both sides lay slain on the field. The aftermath of yet another battle with the Baratheons and the soldiers that managed to survive the bloody clash fought near a ford. I hope you enjoyed these screenshots of Ser Allister. More to come later! I'm a man of my word (and of my sword ) so here is the latest batch of screenshots. I hope you will find them improved, when compared to my earlier screenshots. I've been counselled by one who is the master of all things screenshot (imo at least) and I hope the effects show. So, let's get this show on the road. Ser Allister celebrating after a heated battle with the Baratheons, in which he had 49 men while the Baratheons had a little over a hundred. Quite a bloody victory. After this battle, on the basis of being so damned outnumbered I guess, I also received the fabled Valyrian Steel Greatsword...Heartsbane! Here is one of only three other warriors which survived the battle. Kingsguards of course, otherwise they couldn't have taken so much punishment and lived to tell the tale. 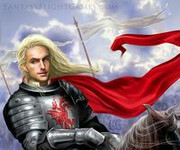 Here is Ser Allister after a victory against a group of marauding Targaryen Loyalists. "All for Joffrey!" is Allister's motto, so the Targaryen sympathisers were all killed. In the image the blade Heartsbane is also visible. Visible in this image is one of my more...unlikely companions and his most beloved sword, which I gave to him after a battle in which he personally slew several opponents. I present to you, Lord Petyr Baelish and his blade, Blackfyre! 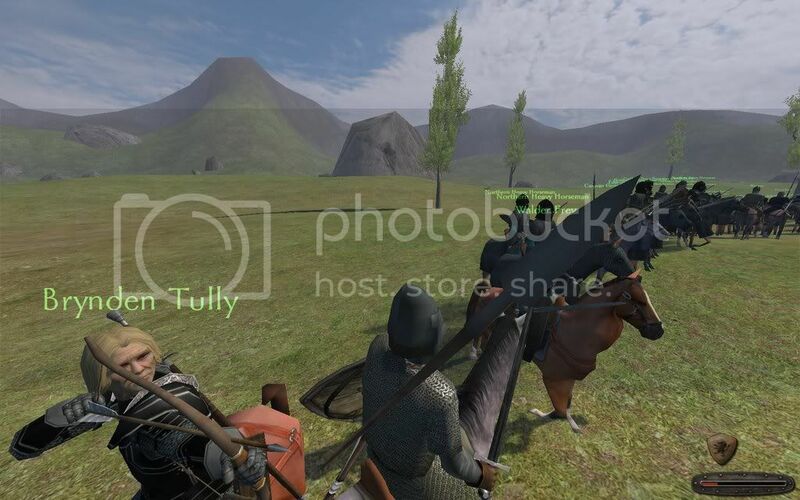 This screenshot was made after Ser Allister liberated a village from the hold of a band of bandits. Also visible is Lord Baelish, with his sword in hand. I hope you've enjoyed these screenshots. I hope I will be able to make several more later, some screenshots which are logo-material. I hope Sparehawk will find use for my pictures, and the pictures of others, as material with which to promote the mod. 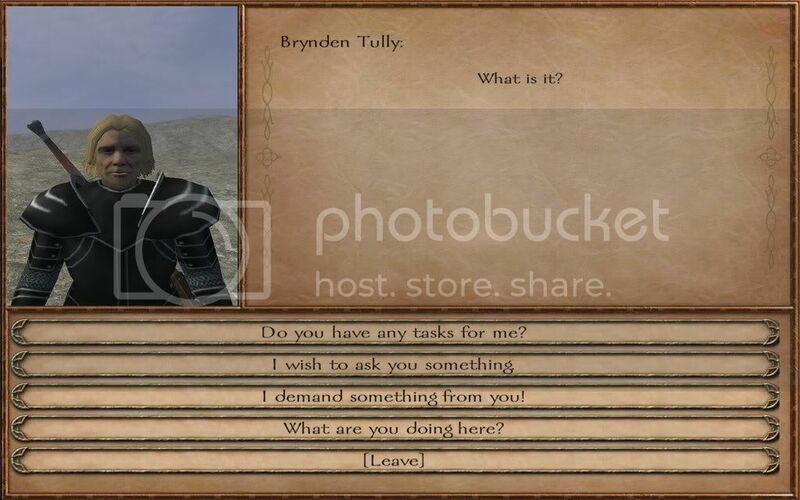 I know I would like nothing more than to see a screen I myself made, promoting one of my favourite mods. It would be an instant feeling of pride, of that I'm sure. Anyway, enjoy the screenshots. They're not much currently, but I hope to add battle-shots with the next batch to come. Nevertheless, these screens make me want this even more =) The potential is awesome. Yeah we were working on revamping the companions..